If you’re tired of hauling anchor by hand, look into a DIY windlass project. I do my boating in the Chesapeake Bay, and the Grady-White Freedom 275 is an awesome boat for these waters. I fish a lot, and I want my wife to be comfortable when she’s aboard, so the anchor gets used a lot as we move around, and hauling up and dropping the anchor can be tedious and difficult, so I decided to install a windlass. 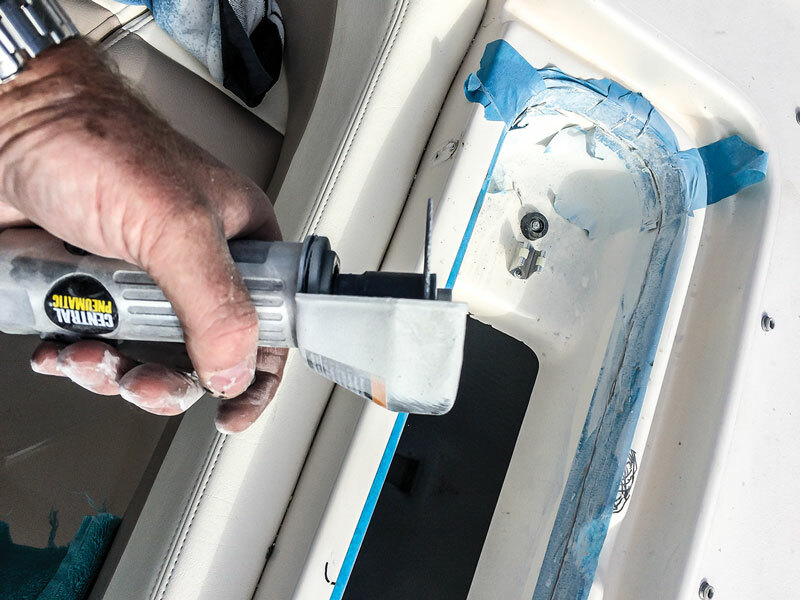 To make things as easy as possible, I decided to use the Lewmar windlass that’s factory installed on Grady-Whites, which came with an install kit specially designed for the 275. It’s a pretty straightforward project, but if you aren’t comfortable drilling, grinding or cutting, you might leave this for professionals. Many of the techniques involved can be applied to other windlasses and boats. The first step after removing the anchor is to stuff a rag down the opening so that nut you invariably drop doesn’t go into the bilge where you can’t retrieve it. 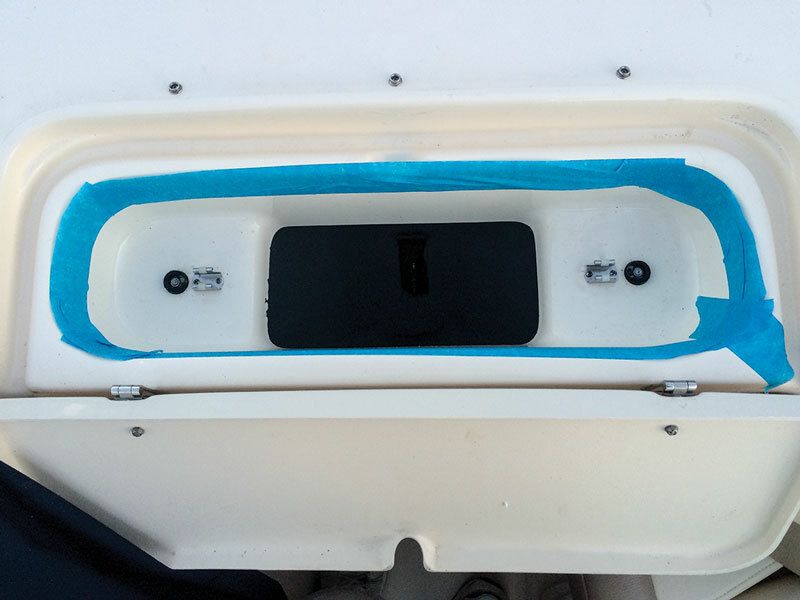 Next, apply blue painter’s tape to the inside lip of the anchor rest (1). You’ve all heard the advice to measure twice and cut once. On a boat, you will want to measure five or six times and cut once. Draw a line with a Sharpie on the painter’s tape at the same depth as the well in front of the anchor rest. Use your hand with a finger on the inside to help you draw a level line (2). Then, use an electric grinder with a thin cutting wheel (3) to cut along that line and remove the anchor rest, so there’s room for the windlass mount. Lay the new windlass mount and all parts into the locker and trace your cuts. Again, measure five times, cut once. Note the position of any preinstalled windlass power cables (thanks Grady-White!) underneath, so you don’t cut them. Make sure you understand the depth of your cut. Also, it’s important that you don’t cut into the fiberglass on the backside of the anchor rest. 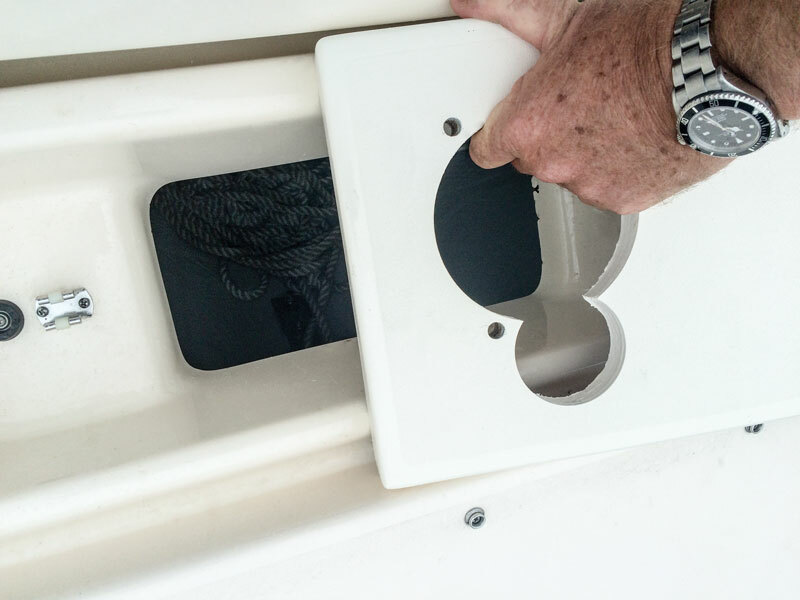 When you lay the windlass mount (4) into position, you’ll notice the smaller hole overlaps a section of the lip, which you will need to grind away. Then you’ll need to drill the holes for the mounting screws, using the windlass mounting plate as a template. 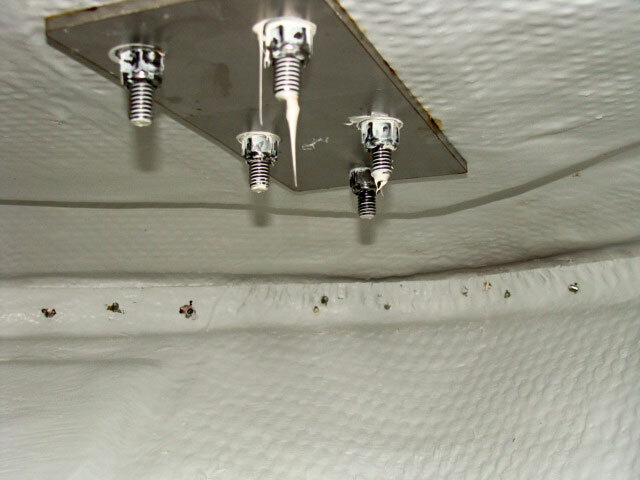 Again, measure several times before drilling a 1/8-inch pilot hole and then a 1/4-inch hole for the bolts. I had to make a small cutout, grinding away some of the fiberglass inside the rode locker to give the motor ample clearance, and I had to cut a section off a washer to make it fit. So be ready to do some work that may not be covered in the directions. Install the metal support brackets using both the bolts and 3M 5200 adhesive (5), which is twice as strong as the 3M 4000. 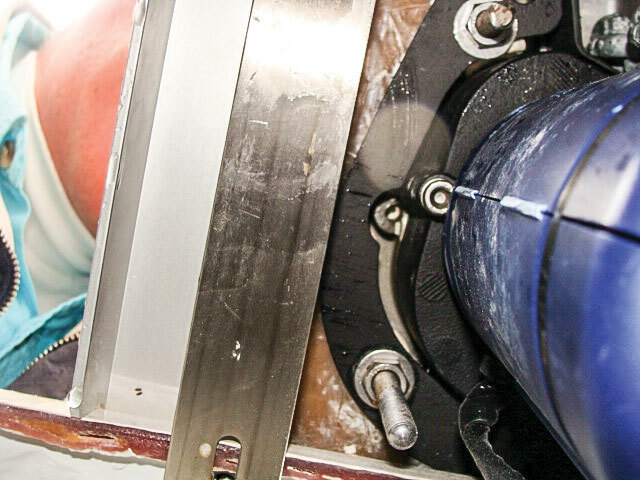 Before attaching the mounting board to the metal support brackets, install the windlass onto it and connect the wiring, which is color-coded. Then bolt and glue the mounting board (which already had the windlass attached) onto the aluminum mounting brackets. Installing the bow roller assembly is pretty straightforward. Measure several times before drilling 1/4-inch holes. I decided to add a 12-inch piece of Starboard as an extra backing plate inside the anchor locker for more strength (6). I used 3M 4000 adhesive to secure the bolts. 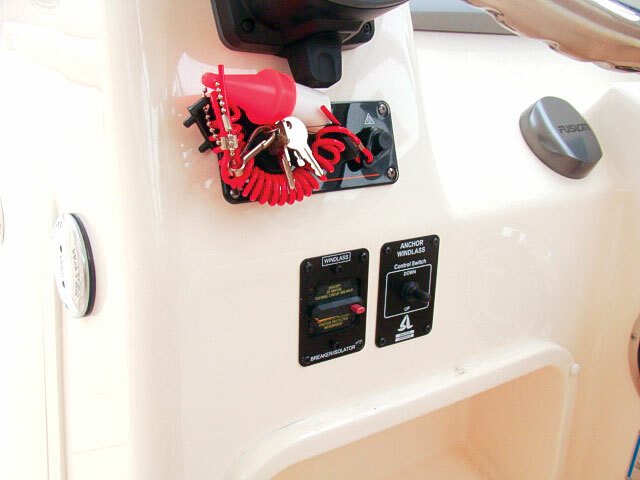 Next, you need to access the wiring for the switch and fuse you will install at the helm. Remove the panel located at the helm’s footrest, taking care not to cut yourself. Cut the silicone bead off, which you will replace with the Grady silicone later. 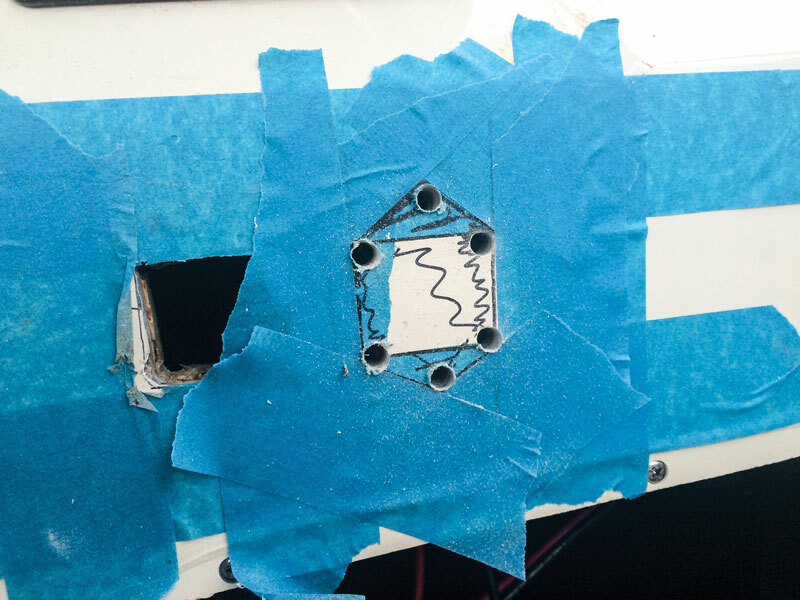 To install the switch, you will have to cut a hole in the helm console (make sure it’s in a location where you won’t accidentally hit it). 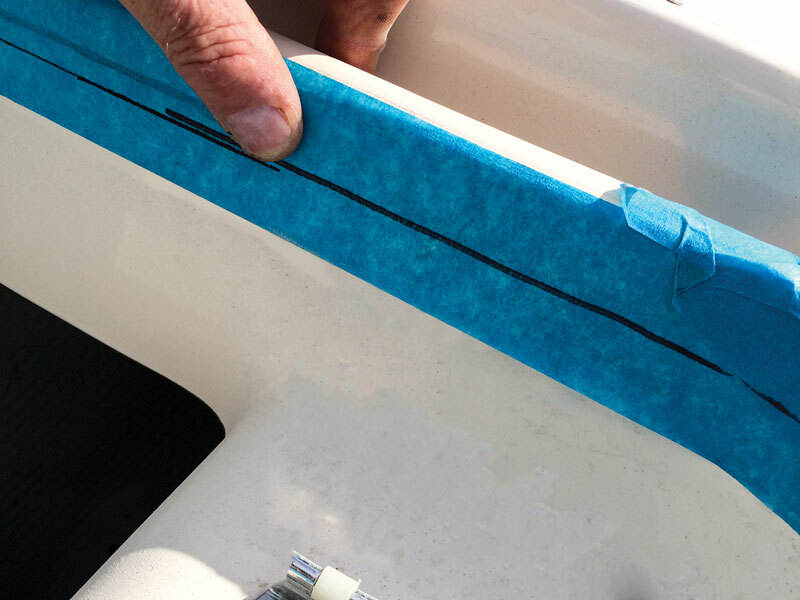 Tape the area well to make sure the adjacent fiberglass doesn’t crack (7). 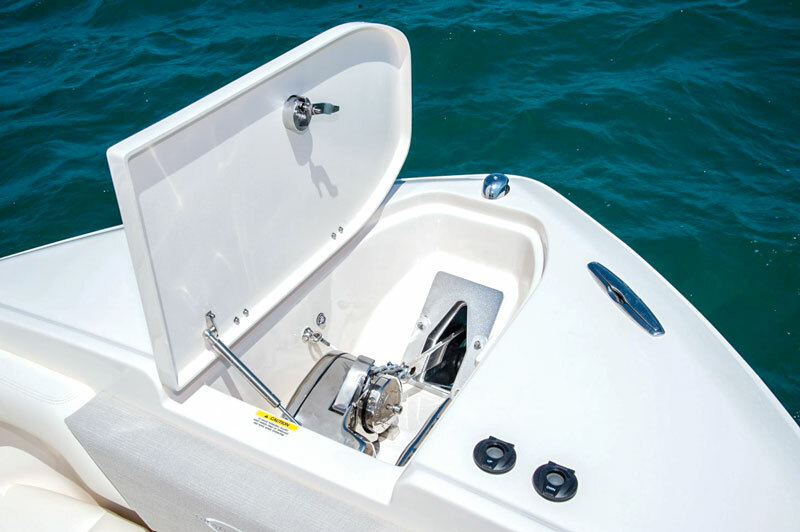 I was expecting the fiberglass to only be 1/4-inch thick, but it was more like an inch, which shows how stout Grady-White builds its boats. Like with the bow roller assembly, I drilled holes around the area to be cut to give the jigsaw a place to start. I found the black and red power cable for the windlass near the steering column, but get a schematic of the wiring to make sure you are using the proper wires. I was really surprised at how small the switch leads were. Before I installed the windlass, I might have stayed at a non-productive fishing spot longer because it was such a pain to haul the anchor. Now, I can just flip the toggle switch (8) and the windlass does all the work for me. My next project is a radar. We love going out at night and need the extra vision!